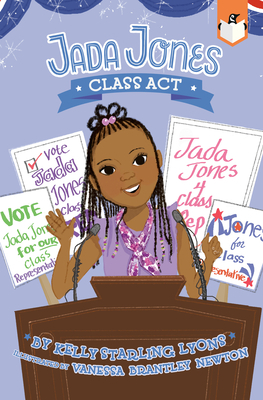 Fans of Princess Posey and Ivy and Bean will enjoy rooting for Jada Jones as she runs for student council in this easy-to-read chapter book. As a candidate for class representative, Jada is ready to give the campaign her all. But when rumors start to fly about her secret fear of public speaking, she isn't sure who she can trust. And the pressure to make promises she can't keep only adds to her growing list of problems. Is winning even worth it when friendships are on the line? This easy-to-read story—with plenty of pictures and a charming, relatable cast of characters—is a sure winner. The early chapter book bridges between leveled readers and chapter books for fluent readers adjusting to the chapter book format. At about 5,000 words, with short chapters and two-color art on almost every page, it will appeal to this unique reader. The two-color art throughout will help readers transition from the familiar four-color art of leveled readers and ease them into black-and-white chapter books. Kelly Starling Lyons is the author of Hope's Gift and Tea Cakes for Tosh. She lives in North Carolina with her husband and daughter and son. Vanessa Brantley Newton is a self-taught artist with a great passion for children's books and fashion illustration. As an illustrator, she includes children of all ethnic backgrounds in her artwork so that every child sees their unique experience reflected in the stories they read. She celebrates self-love and acceptance of all cultures through her work, and hopes to inspire young readers to find their own voices. Vanessa has illustrated over 30 books, and has written and illustrated the picture books Let Freedom Sing and Don't Let Auntie Mabel Bless The Table. She lives in Charlotte, North Carolina with her husband and daughter, and a crazy cat named Stripes.